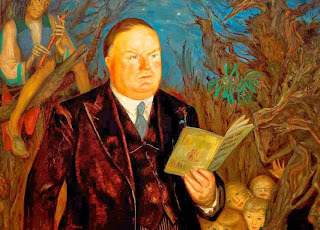 Walter Starkie (1894-1976) was an Hispanic scholar, author, and musician. In the 1930s, he all but abandoned academic life to become a wandering minstrel of sorts, travelling extensively throughout the countrysides of Hungary, Romania, and Spain. He wrote of this vagabond existence in Raggle-Taggle (1933), Spanish Raggle-Taggle (1934), and Don Gypsy (1936). The first book details his adventures throughout Hungary and Romania; in Chapter IV, Starkie speaks of Magyar superstitions, and relates the sad story of an old man who's family was destroyed by a vampire. The tale itself--simply titled "The Old Man's Story"--at times almost hints of Dracula. So one has to wonder: was this truly a tale told to him by firelight, in the middle of a graveyard somewhere on the road to Budapest? Or did Starkie enhance the story based on other vampire tales that he may have read? Robert Rodriguez's new television series, From Dusk Till Dawn, is based on his 1996 feature film of the same name, which starred George Clooney (written by, and co-starring, Quentin Tarantino). Both stories follow the Gecko brothers, two Very Bad Men, who are on the lam and heading to Mexico after a bloody bank heist. In fact, season one of the television series will retell the same story that was presented in the movie, but both it and the characters will be fleshed out across ten, one-hour episodes. The series premiered this week in the United States on the new El Rey Network (Spanish for "The King"), which just launched last December, and features English-language programming targeted towards Latino audiences. The network is owned and operated by Robert Rodriguez himself--and From Dusk Till Dawn is the flagship series for his fledgling network. When I first heard about this adaptation, my thought was, "Why?" --especially considering if you've seen the film, you already know how the first season of the series will progress, and likely end. Yet after watching the first episode, I'm now thinking, "Why not?" Considering the terrible winter we've had in southern Ontario, spring can't come soon enough. 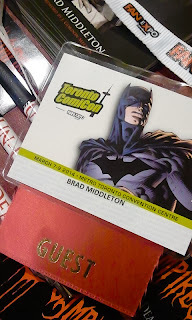 And, perhaps now that the Toronto ComiCon has expanded to a 3-day event, it will forever be tied to the arrival of spring--and become the (un)official kick-off of fan convention season in Canada! By all accounts, Toronto ComiCon was a resounding success, even though two of the major headliners (Jon Heder & Morena Baccarin) had to cancel at the last minute. Held in the south building of the Toronto Convention Centre, this con is smaller in scale than its older cousin, Fan Expo, which will run during Labour Day weekend this year (August 28-31 2014). Myself, along with a handful of other authors--who are part of the Ontario Chapter of the Horror Writers Association--had tables, and we also shared duties covering an information booth for the HWA. 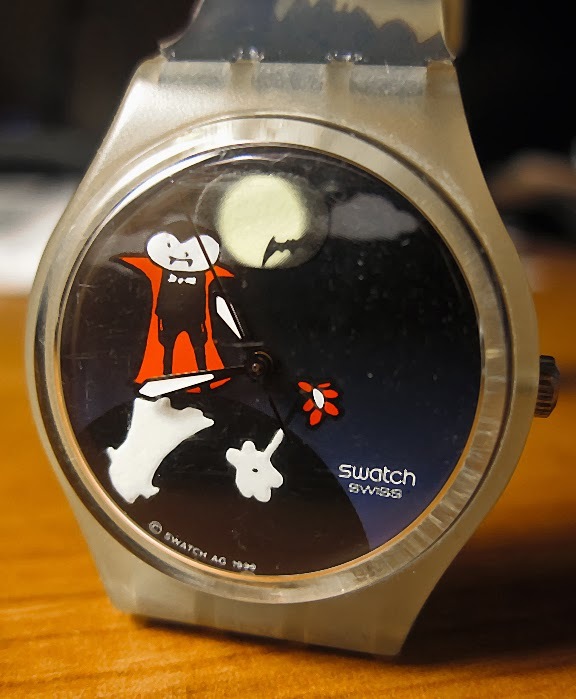 It's interesting what occasionally shows up on Kijiji, such as this Chauve-Souris watch by Swatch, which was manufactured in 1999--and (I believe) only sold in Europe. Designed by American illustrator & cartoonist Ward Sutton, the watch originally retailed for about £52. I bought it used for considerably less--and the fact that it actually still works is a bonus! The face of the Chauve-Souris (which is French for Bat) features a friendly-looking vampire standing under the pale light of the moon--and his shadow, along with the hour and minute hands, glow in the dark! What else could you want from a cool-looking vampire watch?